Though people often choose to visit Rome or Venice when they visit Italy, don’t miss Florence. This historic haven is the home of Renaissance art and architecture. One of Europe’s greatest art cities, Florence is definitely a bucket list destination you shouldn’t miss. Home of Michaelangelo’s David, and works by Botticelli, Leonardo da Vinci and other greats, it’s easy to see why art is the greatest attraction in Florence. From art in the Uffizi Gallery to the artistic intricacy of the architecture throughout the city. You’ll no doubt leave feeling inspired. Other than art, sculpture, and design, we also know Florence for its photogenic spaces and brilliant buildings. If you’re taking a trip to the Italian city, make sure you visit these essential landmarks and beauty spots. The Cattedrale di Santa Maria del Fiore is the main cathedral in the city. It is built in a remarkable gothic style and took almost two centuries to finish. 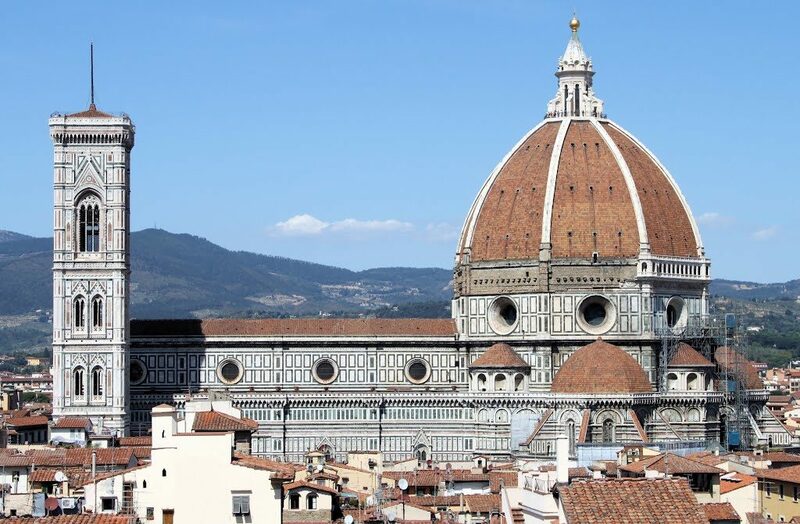 Filippo Brunelleschi was the mind behind its stunning Renaissance dome. The cathedral is perhaps one of the most famous pieces of architecture in Florence. The main square in Florence and site of some of the greatest political activity in the city is the Piazza della Signoria. Many of the sculptures in the square have political connotations in reference to the history that has taken place there. The Loggia dei Lanzi open air gallery also sits within the square – make sure to have a look at the sculptures. If Venice is anything to go by, Italians love beautiful bridges. The Ponte Vecchio is no different. 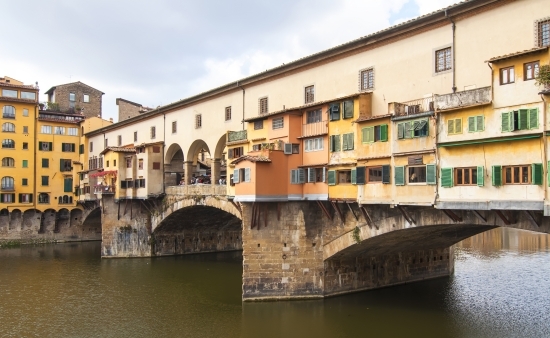 The medieval bridge crosses over the Arno river and is one of the top tourist attractions in the city. It is the oldest bridge in the city and you’ll see it best at night from a Romantic river boat ride underneath. Some of the art in Florence is a little different to that you know of. This art prefers plates to paintings. We view Italy as a country of great, food, wine and love and Florence simply cements that belief. Throughout the beautiful, busy city, there are hundreds of official street food stalls. The name of these stalls is “Chioschi”. Traditionally, there are two types of food these stalls sell. If you’re a meat eater, listen up! The culinary tradition of the streets of Florence is “Trippa” and “Lampredotto”. Lampredotto is a specialty that is local to Florence. It is the fourth stomach of a cow, cooked slowly and combined with tomato, onion, parsley, and celery. Trippa literally translates to tripe and is any tripe based meal cooked on the streets. The recipes hark back to a time when the city was full of the working classes. As such, you can only eat these meals from street vendors, and you won’t find them in restaurants. If Florence sounds like somewhere you’d like to visit, why not get in touch with our buying team. On the other hand if you’re looking to free up your holidays and visit other locations, call our selling team for a no-obligation chat.